The Europe Spring Championship took place over the weekend of 11-12 June, and the winner was ThijsNL. He won $25,000 and entry into the World Championship in November. The format was best of seven, single elimination Conquest. Thijs became only the second player to go back to the World Championship (Kranich is the other one), and the first to win the Europe Championship twice. Thijs display was spectacular, he beat Turna 4-2 in his quarter-final, and then Loyan 4-1 in the semi-final. The final, against Iner, was a closer affair. Thijs brought Mid Hunter, Miracle Rogue, Aggro Shaman, Reno Warlock, and Tempo Warrior to the event. Iner brought Freeze Mage, Miracle Rogue, Aggro Shaman, Zoo Warlock, and Tempo Warrior. Thijs banned Shaman, while Iner banned Warrior. Thijs won game one with Reno against Zoo. Iner levelled the scores with Zoo against Shaman. Iner then soon got established with his Tempo Warrior against Hunter and took a 2-1 lead. Iner declared in his pre tournament interview that you are either Freeze Mage, or you are not. He was comfortable that he most certainly is Freeze Mage, and believes it to be the strongest deck in the game. Going into game four, Iner only had Freeze Mage and Rogue left, and so Thijs chose to pick Shaman. Shaman has a strong matchup against either of those two decks, and he levelled the scores by taking down Iner's choice of Mage. The fifth game featured Thijs' Hunter against Iner's Rogue. If Iner won this game, he would have created a great chance to win the match, not only because of his 3-2 lead, but because Thijs would have to beat Freeze Mage with Rogue at some point. The game was a fascinating one as Iner saved his Sap for Thijs' Savannah Highmane. Thijs played around this however, and won the game with both Highmanes still in hand, having never been cast. Game six was the Freeze Mage against Rogue matchup. This game went as expected, to set up a Rogue mirror match to decide the championship! The final game was a quick one. Iner kept an entire opening hand of Gadgetzan Auctioneer, SI:7 Agent, and Preparation. Thijs' explained in his post-match interview that this gave him the green light to go all-in on an early Edwin VanCleef, as he knew that Iner was extremely unlikely to keep Sap in his hand in a Rogue mirror. The 6/6 Edwin soon became a massive 10/6 after being buffed by Cold Blood. Iner had no way to deal with it, and after a desperate miracle turn attempt, conceded on turn six. When asked about which of his decks he would recommend for ladder use, Thijs said that he felt that his Reno Warlock was the best. 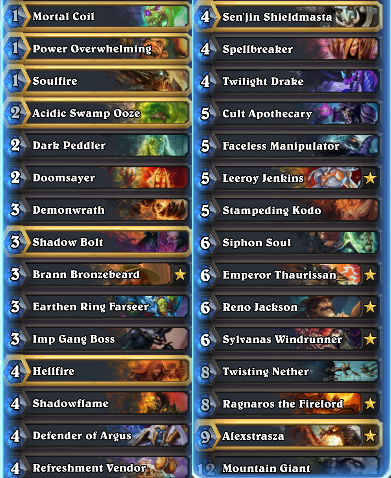 The list for that deck is shown below, while all the other decks from the event are available here. The VOD of the event is available here.